10x Thinking: The Key to Business Growth? 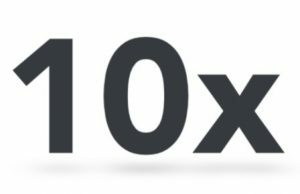 What if, instead of adding 10 units to your business growth per month, you could add 10, then 10×10, then 10x10x10? This is the concept behind “10x Thinking,” a leading approach to business strategy that is gaining significant attention in some circles. In this two-part post series, we’ll talk about the rising trend of 10x thinking and how to make it work for your business. Often, we as entrepreneurs (and individuals), get distracted by the “any benefit” fallacy. If it could help at all – maybe! – we’re tempted to try it. The problem, of course, is we soon find ourselves pulled in too many directions. We nickel and dime away our precious time and energy, and what we ultimately have to show for it isn’t worth the effort. How Do Companies Use 10x Thinking? What Are the Outcomes? While there are plenty of approaches to 10x thinking you can try, the basic concept can be boiled down to two steps. First, cut things that are unnecessary. Then, add things that will create a significant benefit at a slight cost. Set a five-year goal. In one sentence, with specific numbers, write down the thing you will achieve in five years. For every task, ask: “Is this the most important step I can take toward my five-year goal?” If you could do only one thing to get toward your goal, what would it be? If you had only 30 minutes a day to work on your goal, what would you do? Sort tasks accordingly. For instance, if your five-year goal is to double the number of customers that buy one of your products or services every month, hiring outstanding customer service staff will go a lot further toward that goal than handing out business cards at a networking event. To learn how you can integrate 10x thinking into your company’s business strategies, bookmark our blog and read the next post in this two-part series. At TERRA Staffing, our recruiters strive to stay informed about the latest business strategies and goals – and put that knowledge to work for our clients. Contact us today to learn more about our recruiting services in Phoenix, Seattle and Portland. Tags: 10x Business Growth, 10x Business Strategies, 10x Thinking, 10x Thinking in Business, Grow Your Company in Phoenix, How to Grow Your Business in Phoenix, Phoenix Staffing Solutions, Phoenix Temping Firm, Phoenix Temporary Staffing Services, What is 10x Thinking?